​WOTNOT Biodegradable Baby Wipes Now are also available in a hard cover travel case, which contains 20 wipes in each pack. 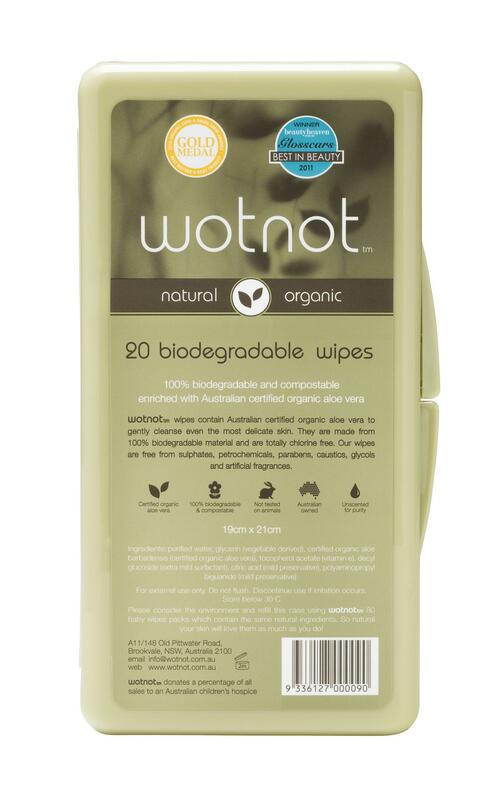 WOTNOT Biodegradable Baby Wipes are enriched with Australian certified organic aloe vera to gently cleanse even the most delicate skin. Ingredients: purified water, certified organic aloe barbadensis* (certified organic aloe vera for healthy skin), glycerin, vitamin e, potassium sorbate (a natural preservative), polysorbate 20 (surfactant derived from fruit and berries), citric acid.